Do you need a reliable taxi service? Then you need the reliable services of Tartan Line. Whether it's just for a short journey or a longer one we will get you there in safety and comfort. Having a mixed fleet of vehicles you won't have to worry that you can't get the right type of car for your needs. If it's for golf outings or you need to pick up a few relatives from the airport, then you can rely on us to get you where you need to go. Available 24 hours a day and all though the year you can rest easy that you will get a cab when you need one. Can we supply a taxi with wheelchair access? The answer is yes we can. With a large fleet of vehicles to choose from we can cover all of your travel needs. 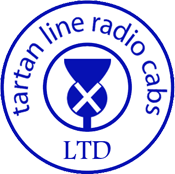 Getting you to your chosen destination in comfort and safety is our main aim, so let Tartan Line take the strain out of your day. In a word yes our drivers want to do a good job as they have an equal stake in the company. They work really hard to keep our hard earned reputation of being the premier line of cabs covering the Grangemouth area. Please ask for a free ring back or a quick text message when you need to know your taxi has arrived and is waiting to pick you up. Why not contact us today and see what we can do for you.